1Energy 2050 Group, Department of Mechanical Engineering, Faculty of Engineering, University of Sheffield, Sheffield, S10 2TN, UK. 2Oil & Gas Refinery Engineering Department, Al-Farabi University College, Baghdad, Iraq. Biomass is a clean alternative fuel to coal in terms of carbon, NOx, and SO2 emissions in the power generation sector. However, ash deposition problems have been a concern with biomass fuels due to the high alkali and residual sulphur contents in the ash forming particles. 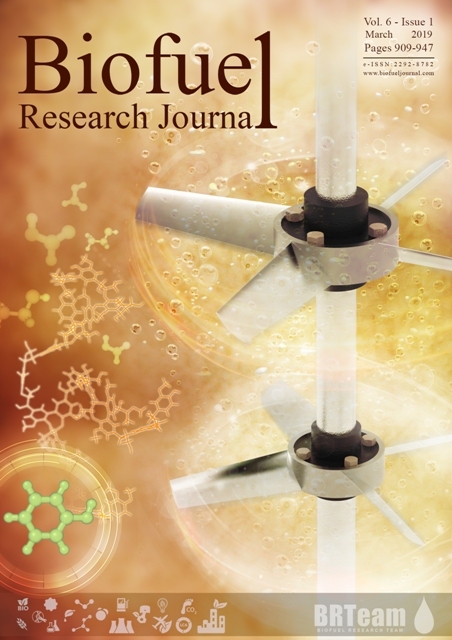 In this study, the influence of oxy-fuel firing conditions of wood pellets combustion on ash partitioning and deposit formation, were investigated experimentally on a 250-kW pilot scale pulverized furnace and theoretically through chemical equilibrium modelling using the FactSage program. Oxy-fuel combustion case was compared with air-fuel case in this assessment. The results of this study showed that wood pellets had a low tendency for radiation zone slagging, but, had a high fouling tendency in the convective passes. It is possible that oxy-fuel combustion inhibited the release of volatile elements to the gas phase in the initial stages of the combustion, thus reducing the alkali sulphates slagging, increasing however, the alkali sulphate fouling tendencies on the convective passes. Moreover, the effect of the oxy-fuel environment on the ash formation was significant. The chemical equilibrium modelling showed reasonable predictions of the ash behaviour of wood pellets in terms of alkali behaviour and explained to some extent the influence of the oxy environment on ash deposit formation. Deposition tendencies of wood pellets are predicted by the ash stream compositions. Wood pellets have a low tendency for slagging and high tendency for fouling. Oxy-fuel combustion reduces slagging yet increases fouling tendencies of alkali sulphates. Oxy-fuel combustion can reduce the propensity of high-temperature corrosion problems. Ash behaviour of wood pellets is significantly changed when replacing air-fuel with oxy-fuel conditions. Bale, C.B., Belslie, E., Chartrand, P., 2015. FactSage thermochemical software and database. Thermfact Ltd. and GTT-Technologies, Montreal, Aachen-Canada. Baxter, L.L., Miles, T.R., Miles Jr, T.R., Jenkins, B.M., Milne, T., Dayton, D., Bryers, R.W., Oden, L.L., 1998. The behavior of inorganic material in biomass-fired power boilers: field and laboratory experiences. Fuel Process. Technol. 54(1-3), 47-78. Baxter, L.L., 1993. Ash deposition during biomass and coal combustion: a mechanistic approach. Biomass Bioenergy. 4(2), 85-102. Fryda, L., Sobrino, C., Cieplik, M., 2014. Comparative study of ash deposition under air and oxyfuel combustion of coal/biomass blends / paper number 810315. Proceeding of the European Combustion Meeting. Gruber, T., Scharler, R., Obernberger, I., 2015. Application of an empirical model in CFD simulations to predict the local high temperature corrosion potential in biomass fired boilers. Biomass Bioenergy. 79, 145-154. Houshfar, E., Wang, L., Vähä-Savo, N., Brink, A., Løvås, T., 2014. Characterisation of CO/NO/SO2 emission and ash-forming elements from the combustion and pyrolysis process. Clean Technol. Environ. Policy. 16(7), 1339-1351. Jenkins, B., Baxter, L.L., Miles Jr., T.R., Miles, T.R., 1998. Combustion properties of biomass. Fuel Process. Technol. 54(1-3), 17-46. Miles, T.R., Miles Jr., T.R., Baxter, L.L., Bryers, R.W., Jenkins, B.M., Oden, L.L., 1996. Boiler deposits from firing biomass fuels. Biomass Bioenergy. 10(2-3), 125-138. Misra, M.K., Ragland, K.W., Baker, A.J., 1993. Wood ash composition as a function of furnace temperature. Biomass Bioenergy. 4(2), 103-116. Nutalapati, D., Gupta, R., Moghtaderi, B., Wall, T.F., 2007. 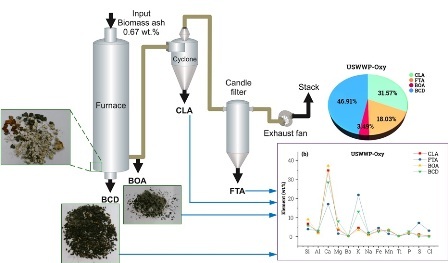 Assessing slagging and fouling during biomass combustion: a thermodynamic approach allowing for alkali/ash reactions. Fuel Process. Technol. 88 (11-12), 1044-1052. Öhman, M., Nordin, A., Hedman, H., Jirjis, R., 2004. Reasons for slagging during stemwood pellet combustion and some measures for prevention. Biomass Bioenergy. 27(6), 597-605. Pronobis, M., 2005. Evaluation of the influence of biomass co-combustion on boiler furnace slagging by means of fusibility correlations. Biomass Bioenergy. 28(4), 375-383. Ragland, K.W., Aerts, D.J., Baker, A.J., 1991. Properties of wood for combustion analysis. Bioresour. Technol. 37(2), 161-168. Ragland, K.W., Misra, M.K., Aerts, D.J., Palmer, C.A., 1995. Ash deposition in a wood-fired gas turbine. J. Eng. Gas Turbines Power. 117(3), 509-512. Shao, Y., Wang, J., Preto, F., Zhu, J., Xu, C., 2012. Ash deposition in biomass combustion or co-firing for power/heat generation. Energies. 5(12), 5171-5189. Shao, Y., Xu, C., Zhu, J., Preto, F., Wang, J., Tourigny, G., Badour, C., Li, H., 2010. Ash deposition during co-firing biomass and coal in a fluidized-bed combustor. Energy Fuels. 24(9), 4681-4688. Sommersacher, P., Brunner, T., Obernberger, I., 2012. Fuel indexes: a novel method for the evaluation of relevant combustion properties of new biomass fuels. Energy Fuels. 26(1), 380-390. Vamvuka, D., Zografos, D., Alevizos, G., 2008. Control methods for mitigating biomass ash-related problems in fluidized beds. Bioresour. Technol. 99(9), 3534-3544. Wei, X., Schnell, U., Hein, K.R., 2005. Behaviour of gaseous chlorine and alkali metals during biomass thermal utilisation. Fuel. 84(7-8), 841-848. Wiinikka, H., Gebart, R., Boman, C., Boström, D., Öhman, M., 2007. Influence of fuel ash composition on high temperature aerosol formation in fixed bed combustion of woody biomass pellets. Fuel. 86(1-2), 181-193. Wiinikka, H., Weiland, F., Pettersson, E., Öhrman, O., Carlsson, P., Stjernberg, J., 2014. Characterisation of submicron particles produced during oxygen blown entrained flow gasification of biomass. Combust. Flame. 161(7), 1923-1934. Xing, P., Darvell, L.I., Jones, J.M., Ma, L., Pourkashanian, M., Williams, A., 2016. Experimental and theoretical methods for evaluating ash properties of pine and El Cerrejon coal used in co-firing. Fuel, 183, 39-54.